Last night's Liverpool Beatles Week concert at the Empire Theatre featured some original Merseybeat bands from the late fifties and sixties, and the concert was dedicated to the memory of Brian Epstein. 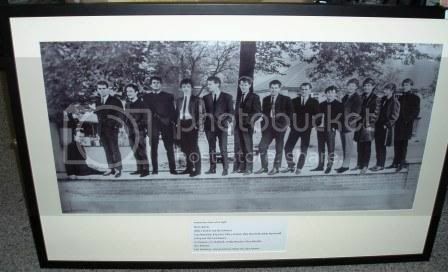 Brian had helped launched Gerry & The Pacemakers and was well-known by local Liverpool groups. Other bands that played were Karl Terry, The Undertakers, The Searchers and The Fourmost. 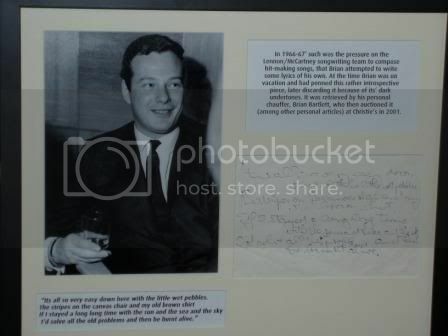 The Beatles Story in its gift shop throughout the day displayed "40 Years Ago, Brian Epstein died, August 27th, 1967. Remember Brian" on its large plasma display screen above the cashiers. 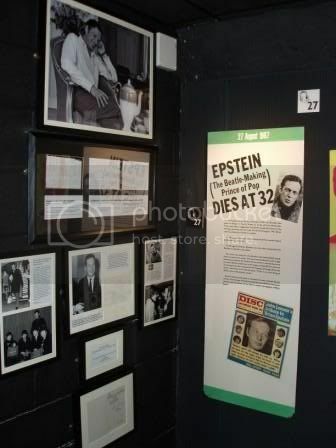 Additionally the Beatles Story displayed new items for the new Brian Epstein 40th anniversary memorial exhibition that opened up on Sunday. The above-mentioned new Eppy items on display were donated by the same nice lady who wrote the above article, Katie Hickox! 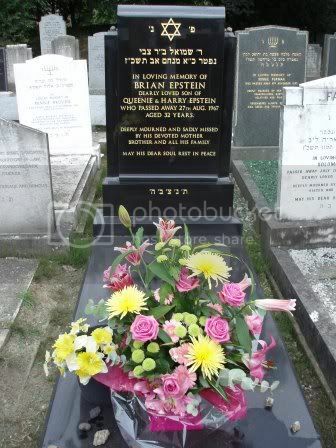 She also took the photo of Brian's grave with the flowers. Know how I often sadly remark that Brian's Boys never did a Concert For Eppy? "I attended this show and what a show it was, Brian would have been so proud of his performers, they really did his memory proud..."
Thanks, Gerry. You were one of Brian's most loyal confidantes, and you are truly top of the pops! Rock on! "There has been agitation for a memorial to Brian in Liverpool. His memorial is in the universal success of The Beatles." I disagree. He may still be well-known in England, but so many people in the US don't even know who he was, even Beatle fans. Several flisters of mine can back me up on this. And really, Brian himself was the type who would be thrilled by the attention ~ on the inside, that is ~ because he usually showed a shy reticence to adulation. But you know he'd love it nevertheless. In order to be eligible for an English Heritage blue plaque, a figure must have been dead for twenty years or have passed the centenary of their birth, whichever is the earlier. Nominated figures must also meet the following criteria: be considered eminent by a majority of members of their own profession; have made an outstanding contribution to human welfare or happiness; have resided in a locality for a significant period, in time or importance, within their life and work; be recognisable to the well-informed passer-by, or deserve national recognition. It should also be noted that: EH plaques can only be erected on the actual building inhabited by a figure, not the site where the building once stood; buildings marked with plaques should be visible from the public highway; unless a case is deemed exceptional, a single person may not be commemorated with more than two plaques nationwide; proposals are be considered for the commemoration of sites of special historical interest. Katie feels it's a disgrace that the City of Liverpool has never erected a plaque in front of Brian's childhood home at 197 Queens Drive in the Childwall area of Liverpool, even though at least three have been put up for John Lennon in different sites. Brian truly deserves, for once, to be honoured ahead of a Beatle or two. Martin Lewis feels it's a disgrace that so many other, almost anonymous non-performers have been inducted into the Rock and Roll Hall of Fame (See my old post on that travesty), and Brian has been cluelessly omitted. Christine agrees with most of the above (except for the plaques, which understandably can only be installed if the current residents don't mind being bothered by large Beatle fan mobs daily ~ see below reply to Anonymous commenter) ~ and christine also feels it's a disgrace that Brian has never been posthumously knighted ~ well, at least received a posthumous MBE. He more than deserved one when his Boys received theirs! How many more times can I say the word disgrace? Can you think of any other ways Brian Epstein can be remembered and assured his place in history as an equal alongside The Beatles? Thank you!